X For protection, it releases a horrible stench from the antennae on its head to drive away enemies. X Als Schutz vor Feinden sondert es einen übel riechenden Gestank mit seinen Antennen ab. X Pour se protéger, il émet un gaz puant par ses antennes, qui fait fuir ses ennemis audacieux. X Para protegerse despide un hedor horrible de sus antenas, con el que repele a sus enemigos. X Per proteggersi emette un puzzo terribile dall’antenna sul capo, tenendo lontani i nemici. X 머리의 더듬이로부터 강렬한 냄새를 내어 적을 물리치고 몸을 보호한다. Y Its feet have suction cups designed to stick to any surface. It tenaciously climbs trees to forage. Y Die Saugnäpfe an den Beinen haften auf jedem Untergrund. Es sucht hartnäckig in Bäumen nach Futter. Y Ses pattes ont des ventouses lui permettant de grimper sur toute surface, notamment les arbres. Y Sus patas tienen ventosas con las que se adhiere a cualquier sitio. Escala árboles buscando forraje. Y Le sue zampe hanno ventose che possono aderire a ogni superficie. Sale sugli alberi cercando cibo. Y 발끝에는 어디든지 달라붙는 빨판이 있다. 필사적으로 나무 타기를 해서 나뭇잎을 먹는다. Omega Ruby Caterpie has a voracious appetite. It can devour leaves bigger than its body right before your eyes. From its antenna, this Pokémon releases a terrifically strong odor. Omega Ruby Raupy ist sehr gefräßig. Es kann Blätter verschlingen, die seine eigene Größe um ein Vielfaches übersteigen. Seine Antennen sondern einen übel riechenden Gestank ab. Omega Ruby Chenipan a un appétit d’ogre. Il peut engloutir des feuilles plus grosses que lui. Les antennes de ce Pokémon dégagent une odeur particulièrement entêtante. 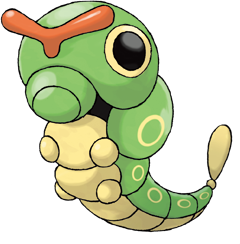 Omega Ruby Caterpie tiene un apetito voraz. Es capaz de devorar hojas que superen su tamaño en un abrir y cerrar de ojos. Atención a la antena que tiene: libera un hedor realmente fuerte. 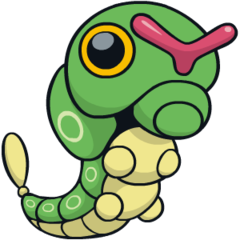 Omega Ruby Caterpie mangia voracemente. È in grado di divorare foglie più grandi del suo stesso corpo in pochi istanti. Questo Pokémon emette un odore terrificante dalle antenne. Omega Ruby 몸보다 커다란 잎사귀를 순식간에 먹어치울 정도의 식욕을 지녔다. 더듬이로 강렬한 냄새를 피운다. Alpha Sapphire Caterpie has a voracious appetite. It can devour leaves bigger than its body right before your eyes. From its antenna, this Pokémon releases a terrifically strong odor. Alpha Sapphire Raupy ist sehr gefräßig, es kann Blätter verschlingen, die größer sind als es selbst. Seine Antennen sondern einen übel riechenden Gestank ab. Alpha Sapphire Chenipan a un appétit d’ogre. Il peut engloutir des feuilles plus grosses que lui. Les antennes de ce Pokémon dégagent une odeur particulièrement entêtante. Alpha Sapphire Caterpie tiene un apetito voraz. Es capaz de devorar hojas que superen su tamaño en un abrir y cerrar de ojos. Atención a la antena que tiene: libera un hedor realmente fuerte. Alpha Sapphire Caterpie mangia voracemente. È in grado di divorare foglie più grandi del suo stesso corpo in pochi istanti. Questo Pokémon emette un odore terrificante dalle antenne. Alpha Sapphire 몸보다 커다란 잎사귀를 순식간에 먹어치울 정도의 식욕을 지녔다. 더듬이로 강렬한 냄새를 피운다. Sun When attacked by bird Pokémon, it resists by releasing a terrifically strong odor from its antennae, but it often becomes their prey. Moon It’s easy to catch, and it grows quickly, making it one of the top recommendations for novice Pokémon Trainers. Red Its short feet are tipped with suction pads that enable it to tirelessly climb slopes and walls. Blue Its short feet are tipped with suction pads that enable it to tirelessly climb slopes and walls. Yellow If you touch the feeler on top of its head, it will release a horrible stink to protect itself. Stadium It has large, eye-like patterns on its head as protection. They are used to frighten off enemies. Gold For protection, it releases a horrible stench from the antenna on its head to drive away enemies. Silver It's feet have suction cups designed to stick to any surface. It tenaciously climbs trees to forage. Crystal It crawls into foliage where it camouflages itself among leaves that are the same colour as its body. Stadium2 For protection, it releases a horrible stench from the antennae on its head to drive away enemies. Ruby Caterpie has a voracious appetite. It can devour leaves bigger than its body right before your eyes. From its antenna, this pokemon releases a terrifically strong odor. Sapphire CATERPIE has a voracious appetite. It can devour leaves bigger than its body right before your eyes. From its antenna, this POKeMON releases a terrifically strong odor. Emerald Its voracious appetite compels it to devour leaves bigger than itself without hesitation. It releases a terribly strong odor from its antennae. Pearl It releases a stench from its red antenna to repel enemies. It grows by molting repeatedly. Platinum It releases a stench from its red antenna to repel enemies. It grows by molting repeatedly. Black It releases a stench from its red antenna to repel enemies. It grows by molting repeatedly. White It releases a stench from its red antenna to repel enemies. It grows by molting repeatedly. White 2 It releases a stench from its red antenna to repel enemies. It grows by molting repeatedly.